We're all looking for better ways to connect with other people so we can have great experiences. The options for electronic connections has grown tremendously from the telephone and e-mail to include instant messaging, SMS text messaging on our cell phones, and social networking Web sites like MySpace and Match.com. Let's not forget about blogs, where comments can be a conversation. And, the newest way to share everything about your life, Twitter. While most of these services can help grow online relationships, their most valuable uses are to share information and arrange face-to-face encounters with another person or group. Bottom line: Face-to-Face matters, and the more people we meet online, the more people we now want to connect with offline. She points out that one of the reasons people attend face-to-face events is the emotional energy of being around others who believe as you do. SXSW attendees believe in the power and benefits of online communication and media. And they came together face-to-face to learn from each other and support each other. Another powerful motivation for attending face-to-face events is physical touch. Whether it's a hardy handshake at business events or a friendly hug or kiss at social events, physical touch is key to great relationships. By the way, she also listed 10 great ways to get people together face-to-face. 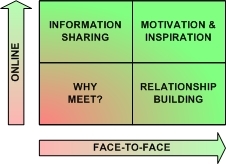 The chart highlights how to choose whether to hold an online event or a face-to-face event. If it's only for information sharing, especially among people who already know each other, hold the meeting online. However, if the attendees need to build relationships and become motivated, face-to-face is still the best way to meet. So, when you’re deciding whether to have an online meeting or a face-to-face meeting, consider whether the relationships everyone will form are more valuable than everyone's cost of traveling to the meeting. Every time we attend an event, whether it's a local networking event or an industry conference, it's important to accomplish your goals for attending. How do you know if you accomplished your goals? Each of your outcomes will be effective when they meet the following criteria. So, before attending events have a few clear objectives in mind so you'll return successful -- and ready to attend again.